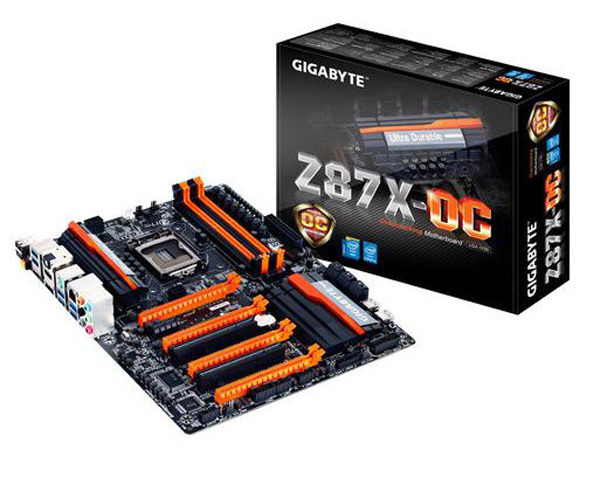 This GIGABYTE GA-Z87X-UD3H motherboard features 4 DDR3 DIMM sockets that support up to 32GB of memory powerful multitasking capability. Support for 2-way AMD CrossFire and NVIDIA SLI technologies enable installation of multiple graphics cards. Features a 3.5GHz processor speed for efficient computing. Unlocked for overclocking potential. Provides fast access to heavily used data and instructions. Compatible with Intel® LGA 1150 processors to support your existing processor. Also features support for CrossFire or SLI configurations for enhanced performance. Includes 16GB of memory (8GB x 2) with 1600MHz speed to suit your needs. Intel, Pentium, Celeron, Centrino, Intel Inside and the Intel Inside logo are trademarks or registered trademarks of Intel Corporation or its subsidiaries in the United States and other countries.